Jason and I have been working away on preparing our kids room, basically sticking to our design plans and floor plan. We painted the walls Ellie Gray from Sherwin Williams. Despite the gray wall, the room will be plenty colorful between the green night stand, various wood tones, the blue crib we’re getting from IKEA, a blue area rug and the bedding. This is the opposite corner of the room, shot from the doorway. Those black tables and white table on the floor are marking the spot where the KURA twin-size loft bed will sit. The corner of the room where the chair is sitting—hopefully a rocker someday—I’m calling the reading nook. We’ll put a set of shallow book ledges along the wall there. The curtain is actually a shower curtain we picked up at Target last year. Nursery curtains was always the plan for it but I’m not convinced yet. I’m going to wait to see how it works with all the furniture and bedding before I split it into two panels. 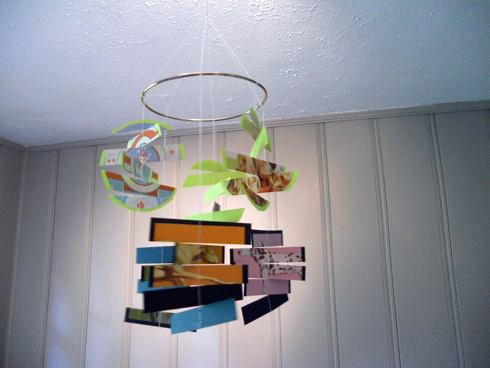 I made this mobile to hang above the crib but honestly, I’m not so sure about it. It’s navy blue and bright green card stock with dog images on one side. It’s growing on me so we’ll see if I decide to keep it. I found this dresser on craigslist a few weeks ago. It’s not the ideal color or height or style but we’re running out of time so it’s close enough.The pack-n-play is posing in the crib’s place. We’re almost there! The last furniture pieces, book ledges and rug will be in place soon. After that we will hang the wall decorations (a couple posters, a clock and some vintage items) and add bedding. I can’t believe how fast we’ve pulled this room together but on the other hand, I’ve been planning it for years… So fun. I’m loving this room and the whole experience of planning and decorating a room for our kiddos! This entry was posted on Thursday, May 19th, 2011 at 8:00 am and is filed under Art, Art: Bedoom for Foster Kids, Art: interior design, Art: kids room, Family, Family: Foster Parenting. You can follow any responses to this entry through the RSS 2.0 feed. You can leave a response, or trackback from your own site. Oh, it is looking cool already! I cant wait to see it with all the furniture in place. I like the grey walls a lot and also really like the shower curtain as a curtain, even as is, one panel. It was so nice to have you guys over! I hope that soon we can get together again and maybe already have our kids playing together! So exciting! Thanks for doing all of these posts about the preparing. I love it! Hi! Random guest comment…I have dark gray slate floors and love the Ellie Gray on your walls…is the color light enough at night (i.e. no natural light)? I want to make sure I pick a cool gray that is light enough to showcase a white couch but light enough to not make a medium-size room look small and dreary. Thanks! Hmm, that’s a tough one to answer from a distance. I don’t think it’s too dark with our dark brown floors so using that logic, I would think it would also work fine with dark gray slate.